Music: Final Fantasy, Kingdom Hearts etc. Anyway really beautiful sight and the idea with the flight is quite nice and suitable for this scan. 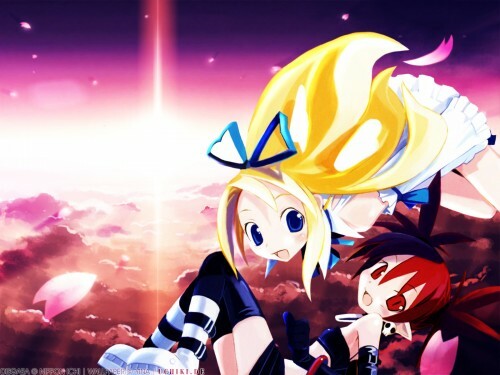 On the other hand I suppose it is a bit too romantic for Disgaea but nevertheless technically superb. The ground looks like the moon? ? Nice job on the background, it looks very impressive. The choice of colors were great too, not too bright and goes well with the scan. the background is fantastic ^_^ sun light is very beautiful and comes nicely. like the way how fluffy looking clouds goes round, they gives quite calming feeling with the redish colouring of the sunset :D redish colours go well with the scan from disgaea and also fit with the theme because in the game there is quite much redish colours. sakura petals gives nicely the final touch to it. overall very pretty background with calm atmosphere and thank you for sharing ! Wow.... you are really a master! this wallpaper is great! fantastic wallpaper. very good use of colors and light. Lol colorful wally, love the seeminly invisible texture on the wall. Wow you really crafted a background that matched the image. The bottom part of the background looks like it was made for that image. :D The shadow on the one petal looks a little funny to me but I like the effect the petals give overall! Such a lovley wallpaper, especially the background, great job +fav.